For centuries, tourists have flocked to Cairo to behold the Pyramids of Giza firsthand. The 4,500-year-old monuments are one of the Seven Wonders of the Ancient World, but they feel just as modern as any piece of contemporary architecture. Last week Egypt’s Minister of Housing Moustafa Madbouly announced that the country will build a triangular skyscraper inspired by the ancient buildings in West Cairo’s Sheikh Zayed City district, according to the Cairo Post. 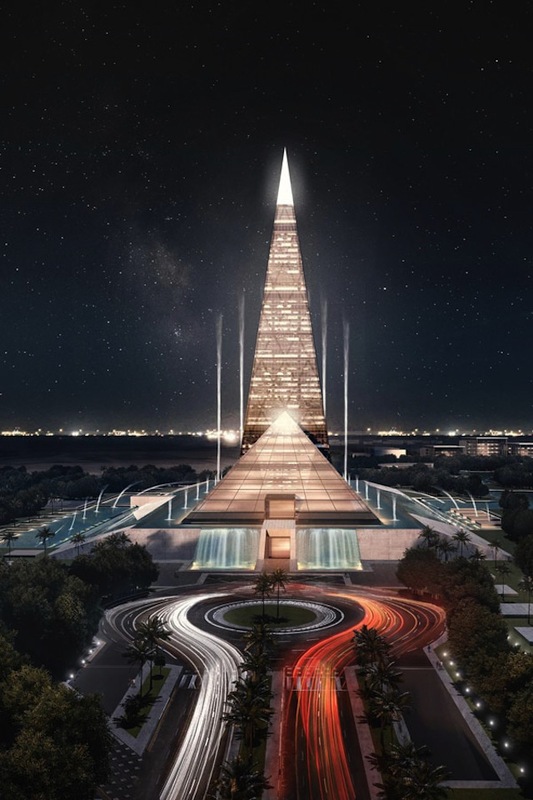 Topping off at approximately 650 feet and dubbed the Zayed Crystal Spark, it will dwarf the Great Pyramid — which sits some 20 miles away — by about 18 stories. When completed it will be the tallest building in Egypt. Though full details will be released at an economic summit later this month, renderings of the 8.5-million-square-foot Zayed Crystal Spark development have already been unveiled. They show two flashy structures: a tall, skinny pyramid alongside a shorter, fatter one. The buildings appear to float within a vast, rectangular water basin — an effect likely intended to amaze, but that comes off a bit tacky in the renderings. Presumably, the yet-unnamed architect intended to create an architectural dialogue in Cairo’s landscape between the old and new. But if the early mock-ups are any indication, the development seems more like the type of imitation architecture you’d expect to find in Las Vegas, not in a location that’s just a half-hour drive from the real pyramids. The whole concept feels strangely distasteful; just imagine if Athens began constructing buildings that mimicked the Acropolis. It’s as if Egyptian officials were trying to squeeze every penny possible out of the iconic pyramid form. And that might actually be the case. Madbouly said the project will bring much-needed investment to the cash-strapped country. Though construction costs haven’t been released yet, the structures will be built through a public-private partnership between real estate developers and the New Urban Communities Authority. “It is an administrative, commercial and entertainment project as it includes buildings for various purposes, in addition to the unique 200-meter tower,” the housing minister said. In a conflict-rattled country where more than 22 million people live in poverty, let’s hope that, at the very least, it serves its intended purpose.